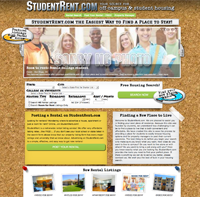 StudentRent.com - Your Source for Off Campus Housing! : StudentRent.com - Better than ever! We've made some upgrades to the look as well as the performance. Now it's easier than ever to post your rental listings. We have extended our free advertising options to longer durations. All of our listings include image upload, social integration, video support and more! If you haven't checked us out lately, please do. We look forward to promoting your off campus and student housing properties / communities! We aim to be the #1 source for off campus student housing nationwide!